This invention relates to treated alumina. Supported chromium oxide catalysts have long been used to prepare olefin polymers in hydrocarbon solution or slurry to give products having excellent characteristics from many standpoints. A number of supports have long been broadly disclosed in the art for chromium oxide catalysts including silica, alumina, thoria, zirconia, silica alumina, and other refractory materials. However, as a practical matter only predominately silica supports have achieved substantial commercial success. Alumina which is almost always included in the prior art in the list of suitable supports, while operable, invariably causes productivity to be extremely low. The preferred prior art support, silica, also suffers from disadvantages among which is the inability to produce ultra high molecular weight polymer using hexavalent chromium. It is an object of this invention to provide an improved alumina. It is a further object of this invention to provide a chromium catalyst capable of giving high productivity. It is a further object of this invention to provide a chromium catalyst capable of producing ultra high molecular weight polymer. It is a further object of this invention to provide a catalyst suitable for use in slurry polymerization systems. It is still a further object of this invention to produce a catalyst capable of making branched polyethylene in the 0.960-0.930 density range from ethylene alone. It is still a further object of this invention to provide catalysts having a wide sensitivity to H₂ as a MW regulating agent, from almost no sensitivity to highly sensitive. It is still a further object of this invention to prepare intimate bimodal mixtures of high and low MW polymers for use in film and blow molding. It is still yet a further object of this invention to overcome the difficulties traditionally associated with both alumina and silica as supports for chromium-catalyzed olefin polymerization. In accordance with one aspect of this invention a silicated alumina is provided, which alumina can also be fluorided and/or phosphated. In accordance with another aspect of this invention, a fluorided and/or silicated alumina support is used for a chromium olefin polymerization catalyst. In accordance with still another aspect of the invention aluminum phosphate is formed in the pores of alumina. FIGURE 1 shows the relationship between density and melt viscosity for UHMWPE polymers made with a variety of catalyst systems. FIGURE 2 shows the relationship between polymer density and intrinsic viscosity. The alumina selected for surface treatment according to this invention can also contain minor amounts of other ingredients which do not adversely affect the quality of the final catalyst but it is generally essentially pure alumina. The alumina can be made as is well known in the art, for instance, by reacting sodium aluminate, which is basic, with aluminum sulfate, which is acidic, or by neutralizing an aluminum salt with a base such as ammonia or ammonia hydroxide, or by flame hydrolysis. If desired, the alumina can be calcined prior to treatment for instance by heating in air at a temperature of 300-900°C, preferably 500-800°C but this is not essential. The amount of combined fluorine is generally in the range of 0.1 to 5, preferably 0.5 to 3 weight percent fluorine, based on the weight of the alumina. The surface silicated alumina is prepared by contacting the alumina with a silicating agent, generally by forming a slurry of the alumina in a solution of a silicating agent. Generally a lower alcohol such as a one to 6 carbon atom alcohol is used as the solvent. After the solution and alumina are mixed the composite is dried. Alternatively the alumina can be subjected to a vapor of the silicating agent. The silicating agent is used in an amount to give 0.2 to 20, preferably 0.5 to 10 weight percent silica, based on the weight of the alumina. The resulting product is alumina with a surface coating of silica which is different than conventional silica-alumina. The resulting novel product is suitable as a catalyst support but is also suitable for use broadly where alumina is utilized. The term "silicating agent" is meant to encompass silicon alkoxides and aryloxides and their hydrolysis products, e.g. alkoxysiloxanes, which upon calcining in the activation of the support or catalyst yield high purity, refractory silica. Examples of such compounds include tetramethoxysilane, tetraethoxysilane (tetraethyl orthosilicate), tetra(2-ethylbutoxy)silane, tetrakis(2-methoxyethoxy)silane, tetraphenoxysilane, and phenyltriethoxysilane and their hydrolysis products and mixtures thereof. A presently preferred silicating agent comprises a polymeric siloxane form of tetraethoxysilane containing the equivalent of 40 weight per cent silica. Such a composition is commercially sold as Silbond® 40 by Stauffer Chemical Co., Westport, Connecticut. The silicating agent can be converted to surface silica after the treatment by calcining as described above or the treated alumina can be allowed to stand until hydrolysis converts the treating agent to silica. In accordance with another embodiment the alumina is treated with a fluoriding agent so as to incorporate fluorine onto the alumina to produce a support for a hexavalent chromium catalyst which is used with a cocatalyst or as a support for an organochromium catalyst. A preferred fluoriding agent is ammonium bifluoride, NH₄HF₂. Also suitable is ammonium silicofluoride, (NH₄)₂SiF₆. While ammonium silicofluoride contains both silicon and fluorine, and while as will be discussed hereinafter, a combination of silicating and fluoriding is within the scope of the invention, ammonium silicofluoride probably does not incorporate anything except the fluorine since the silicon is lost during heating. The fluoriding agent can be combined with the alumina in any suitable manner but it is generally done by forming a slurry of the alumina in a solution of the fluoriding agent and a suitable solvent such as alcohol or water. Particularly suitable are one to three carbon atom alcohols because of their volatility and low surface tension. A suitable amount of the solution is utilized to provide the desired concentration of fluorine in the composite after drying. Drying can be effected in a conventional manner, such as suction filtration followed by evaporation or drying under vacuum. In view of the use of a relatively volatile solvent such as methanol, relatively mild conditions such as 100°C or less can be utilized. A combination of fluoriding and silicating to give F-Si/Al₂O₃ can also be utilized. In such instances, it is preferred to add the fluoriding agent first and most preferred to dry after adding the fluoriding agent before adding the silicating agent. This is because in some instances adding the fluoriding agent after the silicating agent and/or after the chromium can cause an undesirable precipitate. It is possible, however, to add the ingredients in any order. If desired, the fluorided alumina, silicated alumina or fluorided and silicated alumina can be further treated with a phosphating or phosphiting agent to give a system containing up to five components on adding chromium, i.e. P-F-Si-Cr/Al₂O₃. Thus the phosphated or phosphited support can be P-F-Si/Al₂O₃, or P-F/Al₂O₃. Generally when a phosphating or phosphiting agent is to be used in conjunction with the fluoriding or silicating, the phosphorus treatment is carried out first. The phosphating or phosphiting agent may be incorporated in an organic water-miscible liquid such as an alcohol and used to treat either a hydrogel or a xerogel. If the starting material is a hydrogel, then the organic liquid/phosphating agent composition effects both the conversion of the hydrogel to a xerogel and provides the phosphating or phosphiting level desired. More specifically if a hydrogel is used, the hydrogel may be washed with water, then with an organic liquid such as isoamyl alcohol or methanol containing the phosphating or phosphiting agent such as phosphoric acid, or phosphorous acid then filtered and the solvent allowed to evaporate. Alternatively the alumina gel can be treated with a vapor of the phosphating or phosphiting agent. The phosphating or phosphiting agent is preferably used in an amount to react with the alumina to give a P/Al atom ratio of the reaction product on the surface of 0.01:1 to 0.3:1, preferably 0.05:1 to 0.2:1. In practice, however, it is possible to use as much phosphating or phosphiting agent as desired with the excess simply being washed off after the phosphating or phosphiting treatment is complete. The phosphating or phosphiting treatment is generally carried out on alumina which has been previously calcined in air at 300°-700°C. The phosphating or phosphiting treatment is generally carried out at a temperature of 15°C to 500°C, preferably room temperature to the boiling point of the solvent if a phosphate or phosphite solution is bed or about 200°C if a vapor is used and a time of 1 minute to 2 hours, preferably 2 minutes to 30 minutes. Generally a methanolic solution of H₃PO₄ is used. Stated in other terms, the phosphorus component is added in an amount to give 1 to 30, preferably 5 to 20 mole percent of the phosphorus compound incorporated based on the total moles of aluminium. Generally, the ratio of atoms of phosphorus per atom of chromium will be in the range of 100-3000, preferably 500 to 2000. Based on the surface area the phosphorus compound from the phosphating agent is preferably present in an amount sufficient to give about 0.005 to 1, preferably about 0.01 to 0.5 mg P/m² of alumina surface as measured by BET nitrogen sorption. The chromium compound can be any compound in or convertible to the hexavalent state and can be introduced anytime prior to activation. The catalyst contains chromium in an amount generally within the range of about 0.001 to 10, preferably 0.1 to 5, more preferably about 1 weight percent based on the weight of the dried treated alumina support, or since the amount of incorporated treating agent is relatively small, 0.001 to 10, preferably 0.1 to 5, more preferably about 1 weight percent based on the alumina. The chromium compound can be incorporated as known in the art. For instance, a hydrocarbon solution of a material such as tertiary butyl chromate can be used to impregnate the xerogel or an aqueous solution of a chromium compound such as CrO₃ (chromium trioxide), chromium acetate or chromium nitrate can be added to the hydrogel before drying or chromium can be coprecipitated along with the alumina. Preferably the chromium is added after any fluoride treatment and after any phosphorus treatment. The activation of the chromium-containing catalyst can be carried out at a lower temperature than is generally required for activating silica-based chromium catalysts. Temperatures of 300-900°C, preferably 500-800°C, are suitable. The activating ambient can be any oxidizing ambient but for reasons of convenience is generally air. Times of 1 minute to 48 hours, preferably 0.5 to 10 hours are suitable. If desired, the alumina can also be precalcined prior to treatment using the same conditions used later for activation. In this invention so far as the type of chromium is concerned, an organochromium compound wherein the chromium has less than its maximum valence can be used. The organochromium compounds can include zerovalent compounds such as pi bonded chromium complexes such as dicumene chromium or dibenzene chromium. These pi bonded zerovalent chromium compounds are disclosed in more detail in Delap, U.S. 3,976,632 which issued August 24, 1976. Also suitable are divalent organochromium compounds such as chromocene, bis-(cyclopentadienyl)chromium (II), and substituted derivatives thereof in which the cyclopentadienyl rings contain one or more substituents. Chromocene offers the advantage of giving high density, ultra high molecular weight polymer. The organochromium compounds on the treated alumina also tend to have exceptional sensitivity to the effects of hydrogen, thus allowing great leeway in the control of molecular weights since the catalyst inherently gives ultra high molecular weight and yet with the sensitivity to hydrogen it is possible to produce polymers with a broad spectrum of molecular weights with a single catalyst. Examples of other suitable compounds of Formula (II) include octakis(benzyldimethyl-silylmethyl) tetrachromium and octakis(allyldimethylsilylmethyl) tetrachromium. These compounds on alumina treated in accordance with this invention exhibit activity which is truly remarkable and also exhibit substantial responsiveness to the effects of hydrogen. It is also possible to use a mixture of two or more chromium components, for instance, as follows: chromium (+6)-chromium (0); chromium (+6)-chromium (+2); chromium (+2)-chromium (0); or two different chromium (0) components or two different chromium (+2) components or a chromium (0) component and a chromium (+2) component. Use of two components selected from chromium (0) and chromium (+2) is particularly desirable. It is also possible to use mixtures of the total catalyst, i.e. a catalyst of this invention in combination with conventional chromium or vanadium on silica or chromium or vanadium on aluminum phosphate or a titanium or zirconium system. The amount of organochromium compound relative to the support can range from about 0.02 mmole of chromium compound per gm of support to about 5 mmoles chromium compound per gram support. AlX and R⁴AlX₂ compounds where R⁴ is a 1 to 12 carbon atom hydrocarbyl radical and X is a halogen, preferably chlorine. Triethylaluminum and diethylaluminum chloride are particularly suitable. The cocatalyst is used in an amount within the range of about 0.2 to 25, preferably 0.2 to 10 parts per million based on the solvent or diluent in systems employing a solvent or diluent. If no solvent or diluent is used the cocatalyst is impregnated onto the catalyst in an amount to give a mole ratio of cocatalyst:chromium (atoms) within the range of 0.5:1 to 5:1. Based on the chromium in the catalyst in systems employing a solvent or diluent the cocatalyst is used in an amount so as to give from 0.01 to 3, preferably 0.1 to 2 times as much boron or aluminum by weight as chromium by weight. Based on atoms of boron or aluminum per atom of chromium, the amount of cocatalyst used will give about 0.05 to about 14, preferably about 0.5 to about 10 atoms of boron or aluminum per atom of chromium. The cocatalyst can be either premixed with the catalyst or introduced into the reactor as a separate stream, the latter being the preferred procedure. Of course, the final catalyst can be used with, or contain, other ingredients which do not adversely affect its performance, as, for example, other cocatalysts, antistatic aids in the polymerization zone and other conventional ingredients. The catalyst of this invention can be used to polymerize at least one mono-1-olefin containing 2 to 8 carbon atoms per molecule, preferably ethylene, propylene, 1-butene, 1-pentene, 1-hexene and 1-octene. The invention is of particular applicability in producing ethylene homopolymers and copolymers from mixtures of ethylene and 0.5 to 20 mole percent of one or more comonomers selected from 1-olefins containing 3 to 8 carbon atoms per molecule. Exemplary comonomers include aliphatic 1-olefins, such as propylene, 1-butene, 1-pentene, 1-hexene, 1-octene and other higher olefins and conjugated or non-conjugated diolefins such as 1,3-butadiene, isoprene, piperylene, 2,3-dimethyl-1,3-butadiene, 1,4-pentadiene, 1,7-hexadiene, and other such diolefins and mixtures thereof. Ethylene copolymers preferably constitute at least about 90, preferably 97 to 99.6 weight percent polymerized ethylene units. Propylene, 1-butene, 1-pentene and 1-hexene are especially preferred comonomers for use with ethylene. The polymers can be prepared from the catalyst of this invention by solution polymerization, slurry polymerization, and gas phase polymerization techniques using conventional equipment and contacting processes. Contacting of the monomer or monomers with the catalyst can be effected by any manner known in the art of solid catalysts. One convenient method is to suspend the catalyst in the organic medium and to agitate the mixture to maintain the catalyst in suspension throughout the polymerization process. Other known contacting methods such as fluidized bed, gravitating bed, and fixed bed can also be employed. The catalyst of this invention can be used to produce ethylene polymers in a particle form process as disclosed in U.S. 3,624,063 which issued November 30, 1971 to Witt. The catalyst of this invention is particularly suitable for use in slurry polymerizations. The slurry process is generally carried out in an inert diluent (medium) such as a paraffin, cycloparaffin or aromatic hydrocarbon. For predominantly ethylene polymers, a temperature of about 66-110°C is employed. Pressures in the particle form process can vary from about 110 to about 700 psia (0.76-4.8 MPa) or higher. The catalyst is kept in suspension and is contacted with the monomer or monomers at sufficient pressure to maintain the medium and at least a portion of the monomer or monomers in the liquid phase. The medium and temperature are thus selected such that the polymer is produced as solid particles and is recovered in that form. Generally in slurry polymerization of ethylene homopolymer or predominantly ethylene copolymer systems, the feasible temperature range is 150-230°F (66-110°C). In polymerizations using a catalyst according to the second aspect of this invention, the chromium compound and the support can be added separately to the reactor. Alternatively, in some instances, particularly in large, continuously run reactors, it may be desirable to briefly premix support and chromium compound in inert diluent such as n-hexane and charge the mixture intermittently as required to sustain the polymerization reaction at the desired rate. Catalyst (chromium compound + support) concentrations can be such that the catalyst content ranges from 0.001 to about 1 weight percent based on the weight of the reactor contents. When hydrogen is used in the prior art, it is generally used at pressures up to 120 psia (0.8 MPa), preferably within the range of 20 to 70 psia (0.14 to 0.48 MPa). Similar amounts can be used in accordance with this invention although smaller amounts are sometimes preferred with the organochromium because of the sensitivity of this catalyst system to the effects of hydrogen. Stated in terms of mole percent hydrogen based on moles of diluent the hydrogen concentration can be from about 0.1 to 10, preferably about 0.2 to 1.25 mole percent, most preferably about 1 mole percent. Supports employed in the Examples include for the control runs Davison 952 silica and AlPO₄ made according to U.S. 4,364,841. For the invention runs Davison HPV (high pore volume of about 2.7 mL/g (B.E.T.)) Al₂O₃ and Ketjen B Al₂O₃ were used. Melt viscosity data are obtained by means of a Rheometrics Dynamic Spectrometer at 230°C using parallel plate geometry. Strain amplitude is 5 percent, nitrogen is used in the sample chamber and the oscillatory frequency is varied from 0.1 to 500 radians/second. The data obtained give storage modulus and loss modulus as a function of oscillatory frequency. 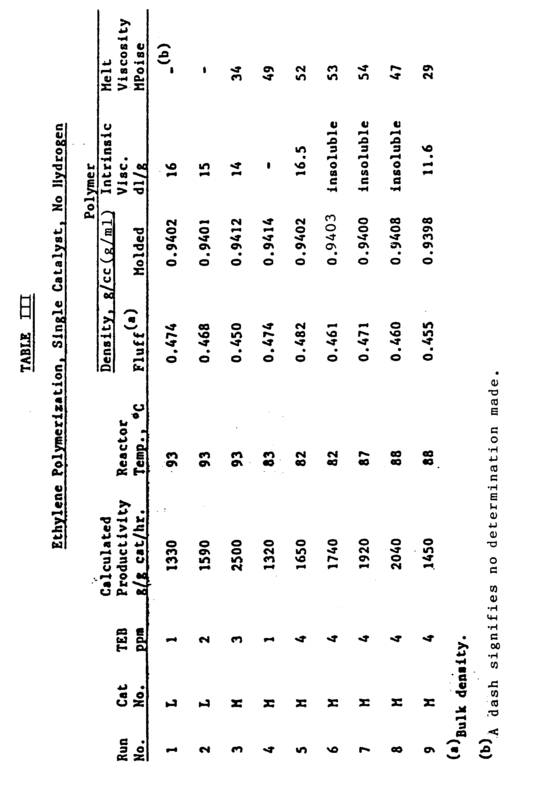 From these data in turn can be calculated dynamic complex viscosity /η*/ as described in Chapter 1 of the "Viscoelastic Properties of Polymers", by Ferry, published in 1961 by Wiley. The values obtained are directly related to polymer molecular weight, with the higher the value the higher the molecular weight. It has been shown for a commercially available ultra high molecular weight polyethylene (UHMWPE) that /η*/ when determined at 0.1 radian/second and 190°C has a value of about 30 MPoise. High load melt index (HLMI) was determined in accordance with ASTM D 1238, condition ∓. A series of catalysts containing combined fluorine and high pore volume alumina was prepared by impregnating the alumina with a methanolic solution of Cr(NO₃)₃·9H₂O sufficient to provide a calculated 1.5 weight percent Cr based on the dry catalyst, drying the mixture and impregnating same with a methanolic solution of NH₄HF₂ sufficient to give the specified amount of combined fluorine as weight percent based on the dry catalyst. Each catalyst was activated for polymerization by calcining in dry air at the specified time and temperature. Ethylene was polymerized in a 2 ℓ stirred stainless steel reactor containing 1.25 lbs (567 g) of isobutane with portions of each catalyst and with 8 ppm TEB (1 ml TEB, 0.5 weight percent in n-hexane) as cocatalyst at 85°C. The pressure (3.9 MPa) was maintained by supplying ethylene as needed from a pressurized reservoir. 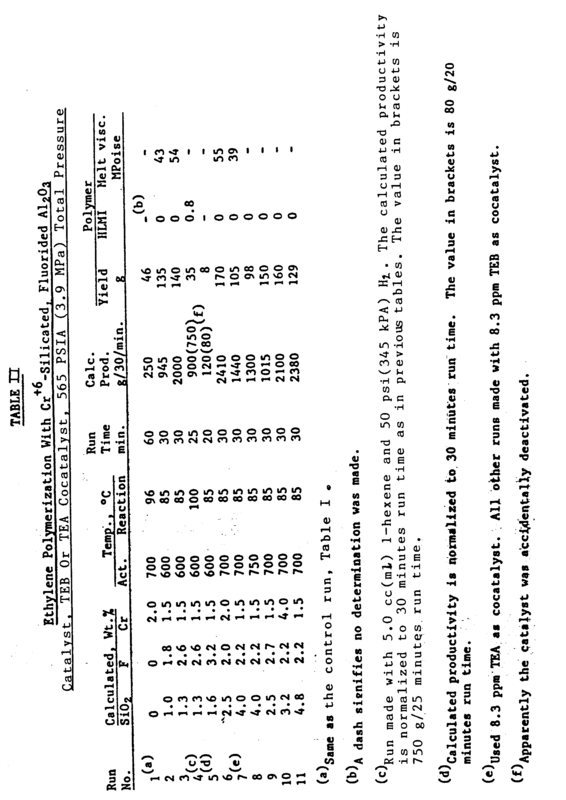 The conditions used and results obtained are set forth in Table I. The results for invention runs 1-4, of Table I all show that fluoriding alumina gives more active catalysts based on productivity results compared to the results obtained in the control run . That is, productivity is increased from about 3.8 to 8.7-fold by the fluoriding treatment, with the catalyst containing about 2.7 weight percent combined fluorine being the most active. Ultra high molecular weight polymer, having a melt viscosity of 40 to 50 was obtained. Run 1 further shows that very small amounts of F are effective Run 5 shows that above 3 weight percent F there is a dramatic deterioration in catalyst activity. Depending on other factors such as surface area, it is believed that 5 percent is the most that would possibly be beneficial, with 3 percent generally being the upper limit. A series of catalysts containing combined fluorine, silica and high pore volume alumina was prepared by impregnating the alumina with Silbond 40® as the silica source, (NH₄)₂SiF₆ or NH₄HF₂ as the fluoride source and Cr(C₂H₃O₂)₃·H₂O or Cr(NO₃)₃·9H₂O as the Cr source in the manner described before. Each mixture was then dried and activated (calcined) for polymerization by heating in dry air for the specified time. Ethylene was polymerized, as before, with portions of each catalyst and with 8.3 ppm TEB or TEA (triethylaluminum, one instance) as cocatalyst, and in one run, in the presence of 5 cc (ml) of 1-hexene and hydrogen. The conditions used and results obtained are presented in Table II. Inspection of the results set forth in Table II shows that the invention catalysts in runs 2-11 are active in polymerizing ethylene to very high molecular weight homopolymers in the absence of hydrogen based on the zero HLMI results. The melt viscosity values of 43, 54, 55 and 39 megapoise shown in runs 2, 3, 6, and 7 are considered to be indicative of ultrahigh molecular weight polyethylene. The catalyst is also rather insensitive to hydrogen as shown in run 4 since the HLMI of the ethylene/1-hexene copolymer made is 0.8. This value is indicative of a high molecular weight polymer. The low productivity of 120 g polymer per g catalyst per 30 minutes is believed to be an anomalous result. The catalyst was apparently deactivated, perhaps inadvertently contacting a poison during its production or in the polymerization process. Several silicated, fluorided high pore volume alumina-hexavalent Cr catalysts were prepared in the manner outlined before. In one instance, the alumina was treated with Silbond 40® and Cr(NO₃)₃·9H₂O in the presence of isopropanol and the mixture dried overnight in a vacuum oven at 80°C. The next day the solid product was mixed with NH₄HF₂ and methanol and that product dried in a vacuum oven as before. The dry product was activated (calcined) is dry air for 3 hours at 700°C to give invention catalyst L.
In the second instance, all the catalytic components employed in invention catalyst L were mixed together in the presence of methanol, dried in a vacuum oven and calcined as above to form invention catalyst M.
Each catalyst, on a dry basis (calcined) was calculated to contain about 4 weight percent silica, about 2.1 weight percent each of chromium and fluorine, the balance-being alumina. A portion of each catalyst was mixed with another conventional catalyst consisting of 1 weight percent hexavalent chromium on aluminum phosphate, P/Al atom ratio of 0.9, the catalyst being activated for 3 hours at 700°C in dry air. This catalyst is called O, for convenience. Ethylene alone and in some instances ethylene admixed with 1-hexene was polymerized in a 23 gal (87 liter) loop reactor in a continuous process at the specified temperatures employing isobutane as diluent, triethylborane (TEB) as cocatalyst and the indicated amount of hydrogen as adjuvant. In this process, catalyst was intermittently charged as a slurry in n-hexane at a rate sufficient to maintain the desired production of polymer. The product in slurry form was intermittently removed from the reactor through a settling leg, flashed to remove diluent and volatile gases and stored. The resulting "fluff" was stabilized with a conventional multicomponent system sufficient to provide about a total of 0.2 weight percent stabilizers, e.g. 2,6-di-t-butyl-4-methylphenol, dilauryl thiodipropionate, zinc stearate, prior to evaluating it for various physical properties. The catalyst systems, reaction conditions and results obtained are set forth in Table III and IIIA. The results presented in Table III show in runs 1-3, at a constant reactor temperature that productivity increases with increasing TEB level, bulk density decreases, molded density remains about the same and polymer molecular weight is decreasing based on intrinsic viscosity data. Although, the intrinsic viscosity results are less than 20, except for runs 6-8 where the polymer was too high molecular weight to dissolve, the melt viscosity results suggest that UHMWPE is made in all the runs, thus all are considered to be invention runs. At a constant TEB level of 4 ppm the results in runs 5-8 indicate that as reactor temperatures increase, productivity also increases and polymer bulk density decreases although little change in molded density is seen. The productivity results obtained are sufficiently high to be of commercial interest. Table IIIA shows the results of ethylene homopolymers and ethylene/1-hexene copolymers prepared with catalyst mixtures containing the invention catalysts. These bimodal homopolymers prepared in runs 10-13 have a higher density than those listed in Table II, reflecting the influence of the AlPO₄-containing catalyst. As TEB level increases in these runs, productivity also increases as before. All polymers show pellet (pelletized fluff) HLMI values ranging from about 7 to 43, and outstanding ESCR for the high stiffness, indicating that good film could be produced from at least some of them, e.g. those having a HLMI of about 20 or less. As expected, with decreasing density, the flexural moduli of the polymer samples also decrease. The following data is presented to illustrate what is believed to be an unusual characteristic of polymers made with the Cr(6+)/F-Al₂O₃ catalyst system. As disclosed in the body of this application, this catalyst produces ultrahigh molecular weight polyethylene, UHMWPE. Generally speaking, density is found to decrease with molecular weight in this type of polymer in the prior art. The hexavalent chromium system mentioned above is unusual in that the UHMWPE polymer produced has the highest density yet observed for polymers of similar molecular weight. Molecular weight is usually correlated to the viscosity of a standardized decalin solution of the polymer according to ASTM procedures D-4020-81, D-2857-70 and D-1601-78. Another, less conventional measure of molecular weight is obtained from the melt viscosity of the polymer using a Rheometrics Dynamic Spectrometer operating at 230°C and .1 radians per second oscillation frequency. The data in Figures 1 and 2 illustrate the above mentioned relationships. For both measures of molecular weight, namely melt and intrinsic viscosity, the Cr(6+)/F-Al₂O₃ catalyst is shown to produce polymer with higher densities than any of the numerous control catalysts within a similar range of molecular weights. Specifically novel polymers are provided having a melt viscosity (M Poise) of 35 or greater, more specifically about 40-60 or in some instances 50 or greater and a density of 0.940 g/cc (g/ml) or greater, more specifically about 0.940 to 0.950 (g/ml), preferably greater than 0.945 g/cc (g/ml). Based on intrinsic viscosity, novel polymers are provided having an intrinsic viscosity of greater than 13 g/dL, more specifically 13 to 17 g/dL or in some instances 15 to 20 g/dL at a density of greater than 0.940 (g/ml), more specifically at a density of 0.940 to 0.950 (g/ml), more preferably at a density at greater than 0.941 g/cc (g/ml). A method of producing a fluorided and, optionally, surface silicated alumina catalyst composition, characterized by contacting alumina with a fluoriding agent to produce a fluorided alumina, said fluorided alumina containing in addition a chromium component, the resulting composition being activated by heating in an oxygen-containing ambient at a temperature within the range of 300 to 900 °c so as to convert at least a portion of the chromium of said chromium component to the hexavalent state and combining the resulting hexavalent chromium-containing catalyst with a cocatalyst. The method of claim 1, wherein said silicating comprises contacting said alumina with a silicating agent in solution or in vaporous form and thereafter converting said silicating agent to silica on the surface of said alumina. The method of claim 1 or 2, wherein said fluoriding agent is ammonium bifluoride. The method of claim 3, wherein said amonium bifluoride is provided in an amount sufficient to give 0.5 to 5 weight percent fluorine on said alumina based on the weight of said alumina. The method of claim 3 or 4, wherein said fluoriding agent is introduced by forming a slurry of said alumina in a solution of said fluoriding agent. The method of claim 1 or 2, wherein said silicating agent is a polymeric siloxane and said polymeric siloxane after said treating is converted to silica on the surface of said alumina by calcining in air at a temperature within the range of 500 to 800 °C. The method of claim 1, 2 or 6, wherein said silicating agent is used in an amount sufficient to give 0.5 to 10 weight percent silica based on the weight of the alumina. The method of claim 1, 2, 6 or 7, wherein said contacting with said silicating agent is carried out in a slurry of said alumina in said solution of said silicating agent in a 1 to 6 carbon atom alcohol. The method of any of claims 1, 2 and 6 to 8, wherein said contacting with said silicating agent is carried out in a slurry of said alumina in said solution of said silicating agent after which the composition is dried and thereafter said fluoriding agent is added by forming a slurry of the thus dried composition in a solution of said fluoriding agent. The method of any of claims 1, 2 and 6 to 9, wherein said alumina has been treated with ammonium bifluoride and an alcoholic solution of polymeric siloxane form of tetraethoxysilane. The method of any of the preceding claims, characterized by additionally subjecting said alumina to a phosphating or phosphiting treatment. The method of claim 11, wherein said alumina is calcined in air at 300-700°C and thereafter contacted with a methanol solution of phosphoric acid prior to contact with said silicating agent or fluoriding agent. The method of claim 1, wherein said activation is carried out at a temperature of from 500 to 800 °C. The method of claim 1, wherein said cocatalyst is selected from organoboron compounds and organoaluminum compounds. The method of claim 14, wherein said cocatalyst is triethylborane. The method of any of the preceding claims, wherein said chromium component is selected from chromium trioxide, chromium acetate and chromium nitrate. The method of any of claims 1 to 15, wherein said chromium component is an organo chromium compound having chromium in a valence less than the maximum valance for chromium. The method of any of the preceding claims, wherein said chromium component is included in an amount sufficient to give 0.1 to 5 weight percent chromium based on the weight of alumina. The method of claim 1, wherein said oxygen-containing ambient is air. The use of the catalyst composition as obtained in any of claims 1 to 19 for the polymerization or copolymerization of mono-1-olefins. 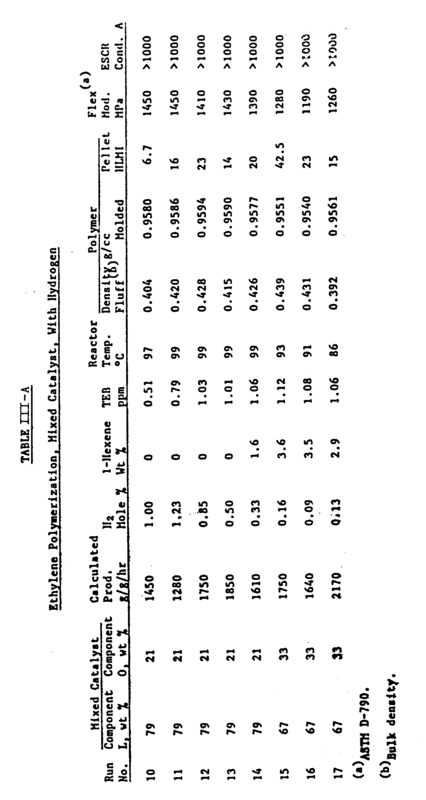 AT85105910T AT94151T (en) 1984-05-29 1985-05-14 Silikatiertes and / or fluoridated alumina. BE1007148A3 (en) * 1993-05-17 1995-04-11 Solvay Support for catalyst, method for producing gel precursor media for catalyst, method for preparing a catalyst support, catalyst for olefin polymerization and method for olefin polymerization using the catalyst . BE1008916A3 (en) * 1994-11-16 1996-10-01 Solvay Polymerization catalyst system for olefin polymerization process and at least one olefin in the presence of this system catalyst. BE1010715A3 (en) * 1996-10-25 1998-12-01 Solvay Ethylene copolymer and at least one alpha-olefin and method for obtaining. ES2292131T3 (en) 2004-04-30 2008-03-01 Basell Polyolefine Gmbh Process for the reduction of chromium oxide catalyst activated. 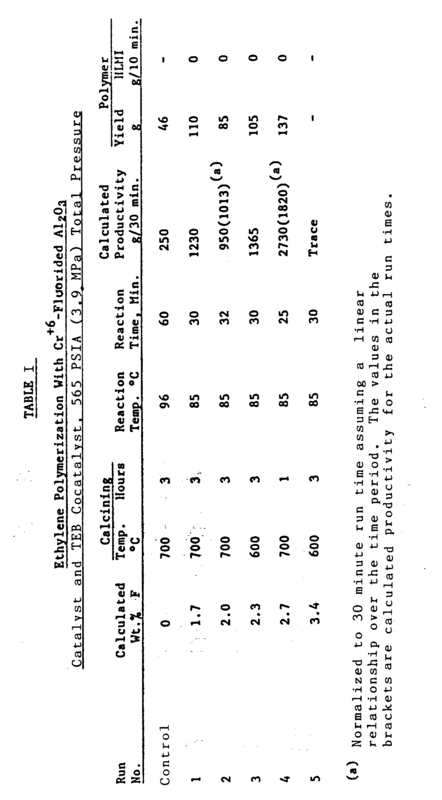 NL174953C (en) * 1970-11-24 1984-09-03 Degussa A process for hydrophobizing of metal or silicon oxides. DE3030916A1 (en) * 1980-08-16 1982-04-08 Basf Ag Ethylene (co)polymerisation carrier catalyst prepn. - by coating porous finely-divided silica-alumina support with chromium hydrocarbon complex cpd.